OtroMundo Voyage to Tranquility. Inspired by Treasure Island Beach, a beach I had dreamed about on my birthday. Eco-friendly oil over organic marble Italian textures, recycled glass particles, natural beach sand, and melted copper leaf on museum-quality wood. 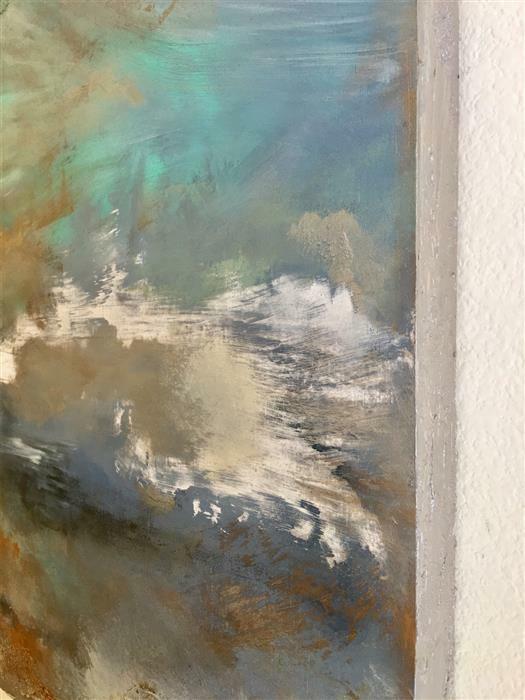 Ombre (light to dark) shades of copper, silver, Tiffany blue-green, taupe, neutrals, grey, bluish grey, with hints of metallic teal & champagne. Versatile vertical or horizontal statement. Each panel is 24x24. Shown with 2" separation. 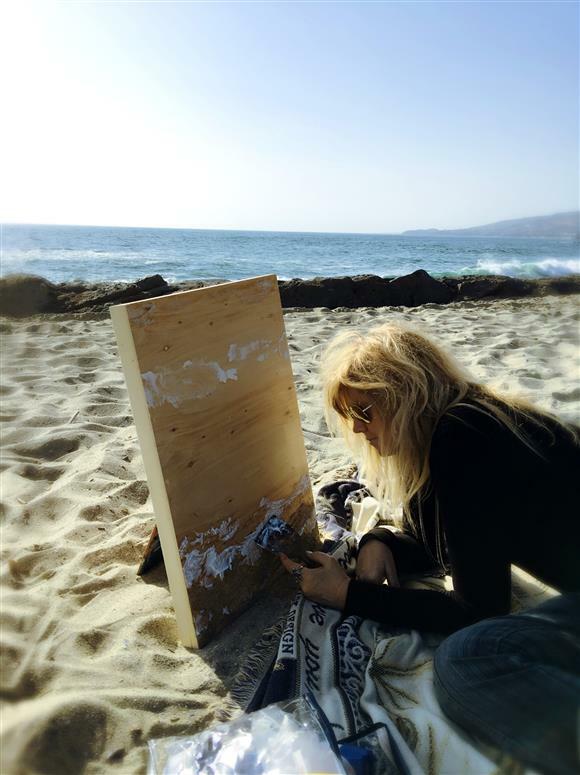 Michele Morata takes a very spiritual approach to painting, letting each piece come through her. 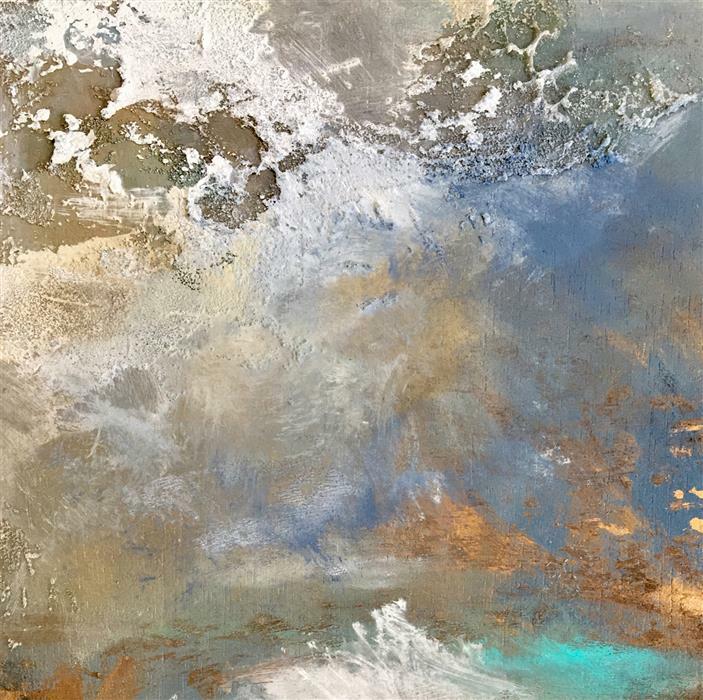 Her works feel abstract, atmospheric, and serene. 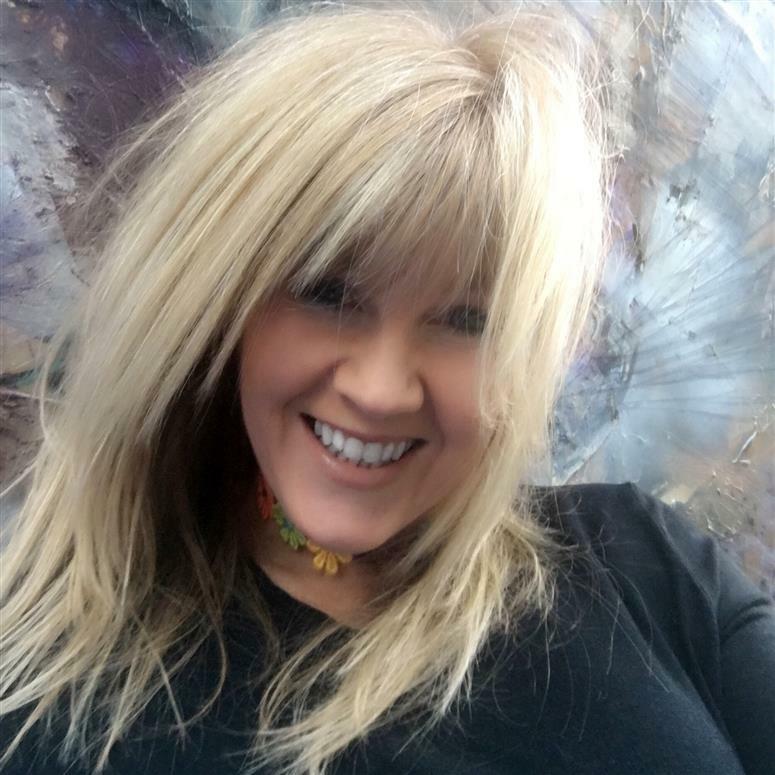 She currently lives in California, near the ocean and mountains, and finds inspiration in meditation and positive human emotions. She considers herself an eco-friendly artist and has researched mediums that are organic or recycled in nature. Looks great Michelle!! See you soon. Love this piece. It is hanging above the bed in one of our condos. Hi and Thanks. You could try M. Graham Walnut Alkyd Medium. I have been told it is nontoxic and has minimal or no fumes. Do not use water with it, however, or very minimal water if necessary. I paint Alla Prima, and usually do not use anything to speed it up these days. It sounds like you 'might' be a layer or glaze painter (I am just guessing) and I do not work that way. I always work Alla Prima & mine usually take 1-2 weeks to dry, depending on the weather and how thick I go. I do not use very much water either, just enough to get the flow. I am in CA and the weather patterns seem to be changing but 2 weeks normally does the trick. If you go back in for any reason if you are Alla Prima, yes you have to start the clock again at 2 weeks! It might depend on where you live also regarding climate. I do work with non-toxic Spike of Lavender on rare occasion, and the studio and even my home, AND the paintings smell of Lavender for a few days! Although it is very strong and I have had to experiment with it. The Spike seemed odd to work with it, meaning a bit unpredictable. Sometimes, the Spike of Lavender seemed to speed, and sometimes it seemed to slow (?) even though I spoke with Holbein several times about it, I still could not get straight answers on it. So with Spike of Lavender, unfortunately you will have to experiment with it. Do not use aromatherapy cause that does not work! My guess is that with the Lavender, it depends on what colors we are working with, although no company has told me that directly. I rarely use the Lavender even, due to the unpredictable nature and the style in which I paint. I have a tendency to pull the palette in an intuitive fashion with no planning at all. I hope this info helps you and please spread the word for other artists to stop using chemicals. Happy Holidays! I love your work. I also use waterbased oils. I am having a problem with drying time, they take weeks. Do you have a solution for slow drying time? "Design Bureau" Magazine Press Interview tomorrow for 8 original paintings inspired by my work with fabulous HGTV interior designer, Beth Whitlinger, for her "Contemporary Bachelor Pad" project. Thank you for your kind feedback! I only use Oils in this particular series. My favorite medium is the eco-friendly water-based oils that present exactly like traditional oils which is fabulous. This is the medium I have been using since 2003 when these 'special' Oils were first available for sale. A little pricey for some artists, but I jumped on this medium as I have always been aware that I wanted to minimize or eliminate chemicals in my studio. 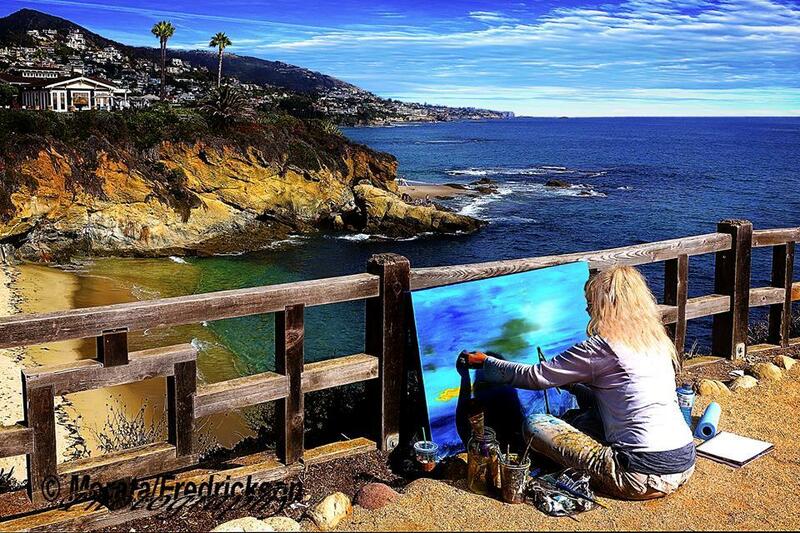 I also encourage other Oil artists to do the same for our collectors, ourselves as painters, and our earth environment. Regarding online versus in person, up close and personal it is easier to see the brushstrokes than online I have noted. Although, online or in person my Oil work does have a dream-like quality. Sometimes I scan a painting so that the potential collector can view the brushstrokes even more, if they like. Most people are drawn to the work that resonates with them on a deep level and speaks to them in some way. Michelle, we love the artwork we purchased from you. It is in a prominent place in our dining area and we've gotten so many wonderful comments about it. The blending of colors and the moods that it evokes are outstanding. Thank you. Hi Michele - I really like this painting. Do you have more larger in this style? Can you tell me more about this piece? It seems lovely! This is an amazing piece of art by an amazing artist. I will definitely buy from Michele Morata in the future. Hi. I'm fascinated by your painting Enlightenment. I love the colors also. Can you tell me a little about this one. Thanks in advance. 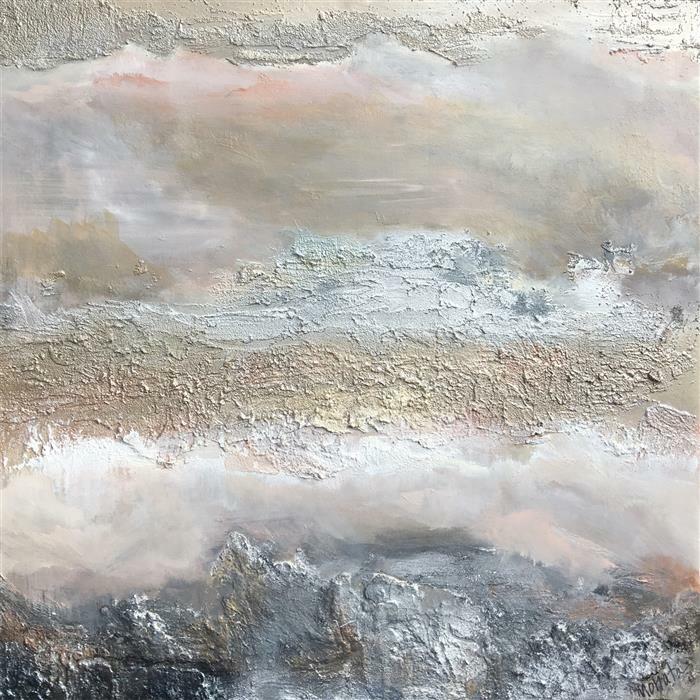 The talented artwork of Michele Morata brings on a whole new dimension through the textures and colors of her beautiful spirit. Art is always in the eye of the beholder, yet her masterpieces, when carefully studied bring joy, peace, serenity and comfort. 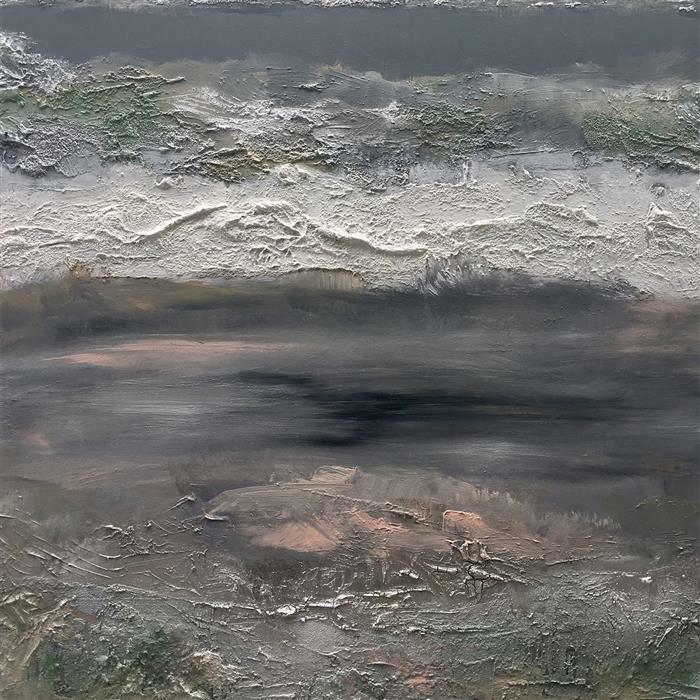 Each texture and each color can be viewed as an individual statement in each painting. 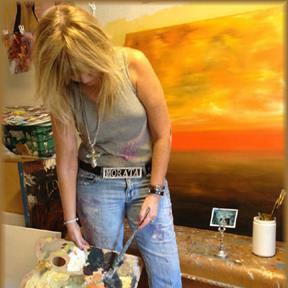 She has been blessed with a beautiful spirit that Michele conveys and shares in her work. Her talent is truly a gift from God! I love the tranquility her art has brought into my home....... Thanks Michele! I have been reviewing your paintings for quite some time and look forward to purchasing hopefully a large painting very soon. 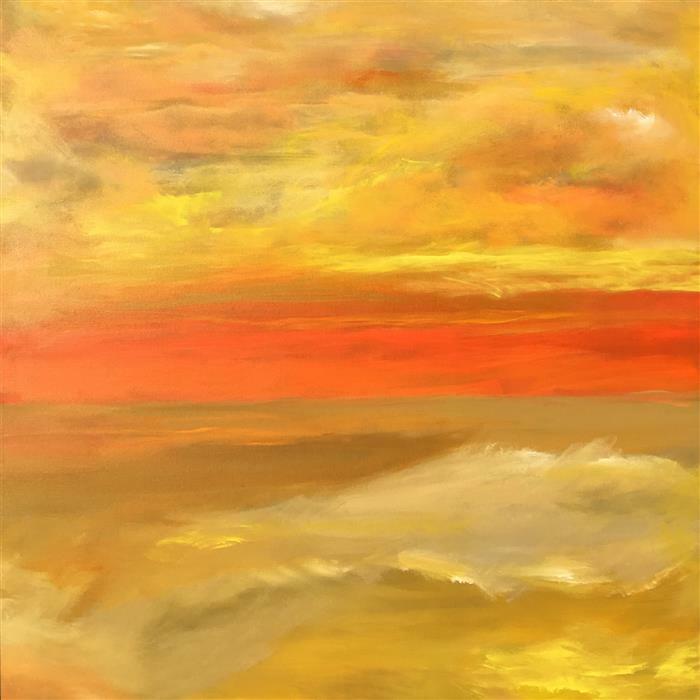 I find your skies in many of your oil paintings fascinating and quite unique - I don't see skies like this very often in paintings. Hello, I love "Magnetize II." Quite beautiful and perfect for our space. We're in San Diego, is there any way we could see it in person at your studio before buying it? I can be reached at nicolenestojko@gmail.com --- Thank you! Thx AR! I paint my textured oils in studio as the materials I use in this artwork is complex: each painting is 3 paintings in 1 & layers need to be protected while drying.This is a different process than pure oil.I begin with plaster from Italy and lay down the 1st painting layer.Second, I embed archival paper products or other ecofriendly materials.Third layer, an oil painting on top of the other 2 layers. It's a longer process as each layer has to dry. My oil is waterbased but still takes a approx 1-2 weeks to completely dry before release & ship, or transport to art gallery. Michele, was wondering if you use the same process for all your series? I notice you do texture and non-texture oils. Do you paint the textured ones on location? I think the fact that you are using ecofriendly materials is quite fascinating. I really like your paintings. Hi, I'm interested in "Dreamland" and was wondering if you could tell me a bit about it. Was it inspired be an actual location or is it an emotional place? The colours and the light in the painting is wonderful. Also, are your paintings signed? Thanks. thx S Brooks ! i'm enjoy working with the brighter oranges also ... I like to paint what I call 'earth tones' with a kick sometime. A Happy and Colorful 4th of July to all ! 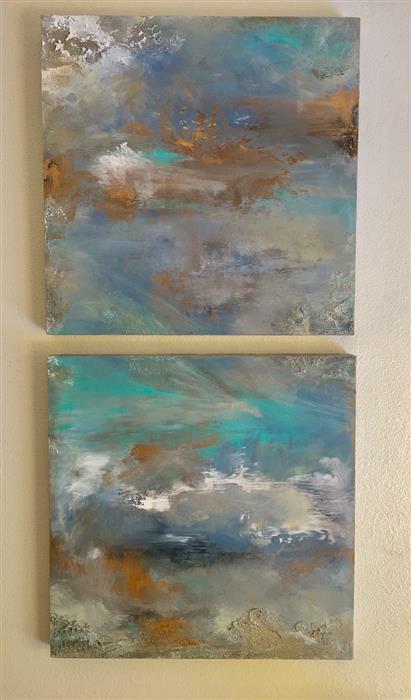 I love these NatureScapes - looking for one in your sold category with more 'brighter' orange even ... I'll keep checking back. I've never done commission but thinking about it. I love your peaceful paintings - they are beautiful. Thanks for kind words! I'm working on some small and mid-size Teal original oils in June and July ... check back at Ugallery or feel free to commission a work thru Ugallery of any size! I have been producing commissions for many years and my collectors have always been very happy with their commissions. Thanks again for your interest! Artist News: My 6 month public art mural has been completed at Mission Hospital, Mission Viejo, CA. For local residents, please let patients and family members know there is a meditative art mural designed to promote peace during difficult times. The hospital's outdoor healing garden is connected to the back of the 24/7 chapel. Dear Sharon: I'm so happy that the painting is so nicely situated and you are pleased with the original oil painting. Thank you dearly for taking your time out to give me this kind response and feedback. 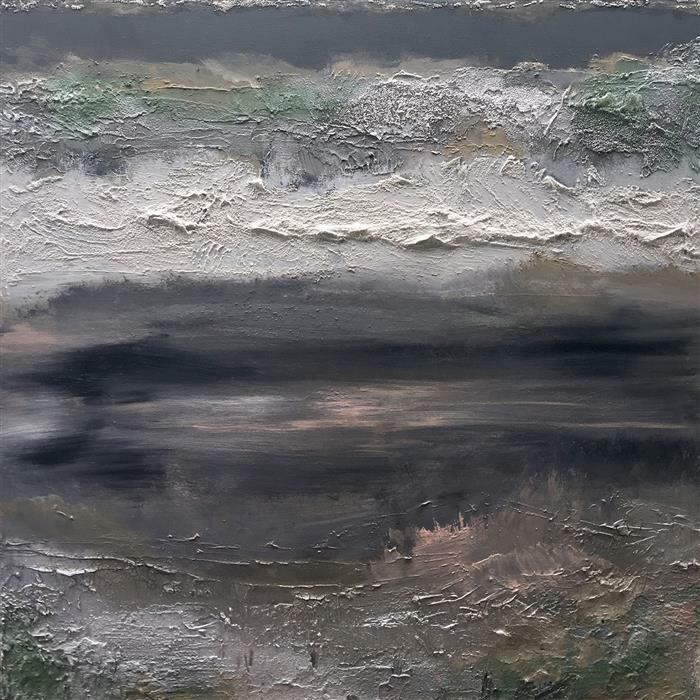 I believe my paintings to be a 'collective' experience and end up with the owners that are meant to have them, and the whole creative process is complete when the painting connects with the viewer(s) in this manner. Peace and love to you thru the holiday season, New Year, and may every day be a beautiful new beginning for you and your artwork. we are the proud owners of "Silence"-and absolutely are enchanted with it!! it makes a wonderful statement in our space. We look forward to owning more of your work!! Many of my vertical oils can be turned into horizontals - it all depends on the space available and what the client prefers ... sometimes galleries turn them upside down for different effects or I've seen them hung horizontally as well at times. Thx for your kind words and a big thank you to everyone who is purchasing my paintings at Ugallery. Peace, light, and happy holidays to all! Hi Michele - wondering if some of these contemporary vertical oils can be turned and hung horizontally? what is your opinion on that ? thx and I love your work ! News: I'm currently working on a commissioned contemporary 'healing art' large outdoor mural for Mission Hospital, Mission Viejo, CA located in their Healing Garden outside the chapel. I'm using archival Plasters from Italy that I utilize in my mixed-media Contemporary Paintings to produce this public artwork.